Description: An NYS&W local crosses Overpeck Creek while a PC River Line local with U25B 2630 is at the Eastbound home signal at CP5. 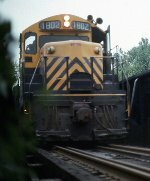 Description: GP18 1802 has just come up out of the yard to drop some employees off at the parking lot when the 240 arrived with the local at the end of its day. Description: The Westbound local freight on a cold, damp Winter day. 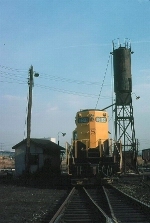 Description: NYS+W Passaic Br. at Boulevard,Elmwood Pk. Description: Between Rte.17 and Garibaldi Ave. Description: My first ever Suzy-Q train - I'd actually dreamt that I would see this train that morning... weird. It's crossing Moore Street here with the Bergen Record building in the background. I still recall that semaphore signal dropping and the realization that a train was coming! Sadly, I had my Kodak X15 Instamatic. As an aside, look at the crossing gates... notice the black and white stripes on the gates and the 'old' lantern-style teardrop lamps. When was the last time you saw those? Description: As the train pulls away to Main Street it passes an office building errected on the foundation of the original NYSW Hackensack depot. Note the wave from the friendly engineer. GP18 #1802 arrived on the property 8/62, with two sister GP18s. These were the first units to wear the yellow-jacket scheme. They were bought on a government loan arrnaged for by Irving Maidman, who had bought the Edgewater Ford plant and then bought the railroad to ensure service. Maidman, however, cut costs and killed the commuter trains. Description: US 1-9 and County Rd. Description: Between Jct. and Essex St. 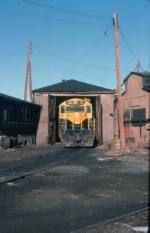 Description: NYS&W GP-18 #1802 sticks her head out of the engine shed in Little Ferry NJ January 1980. Description: One of NYS&W's oldest diesels is coupled to one of their latest acquisitions: a pair of CR C-430's. This one is the 2052 which will become NYS&W #3002. Description: New kid in town! NYSW brief takeover of southern tier. Wish I had more photos of that era. 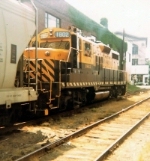 Title: NYSW 3000 on NTV-9 double stack train. Description: Third, fourth, & fifth units.